As you know, in recent years, Atlanta has become quite the hot spot for the entertainment industry. From the Walking Dead to Hidden Figures to Stranger Things, some of the most talked about movies and TV shows are filmed right here at home. That’s where child acting headshots and modeling photos come into play. These projects typically bring in Hollywood actors for the lead roles, but many of the smaller parts and background characters (“extras” as they say in the biz) are locals. That means Georgians with the acting bug don’t have to head to LA to pursue their dreams – or the dreams of their children. 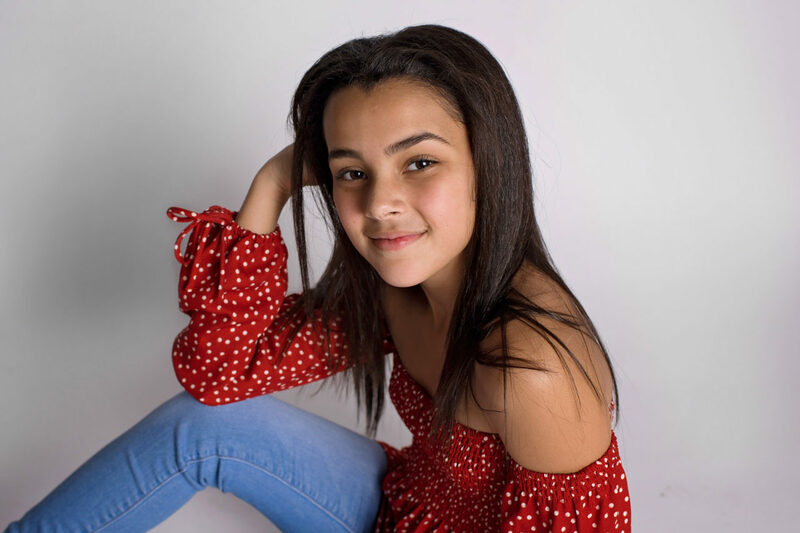 That’s right, the acting bug can bite early, and if your child has a dream to break into acting, the first step is to have some professional child headshots and modeling photos done. You’ll need these to submit to agents and casting directors. Like a resume you’d use while job hunting, these pictures are submitted before anyone will even talk to you or your child. Child headshots and modeling photos are a different style of photo than you may be used to seeing from me, but it’s something I’ve been doing more of recently. Check out some of my work in child headshots and keep reading for advice on child headshot must-haves and what makes child headshots and child modeling photos great. You’ll need multiple shots to show agents and casting directors the child’s versatility. Typically you want at least two different looks for child headshots. The first one should be simple and smiling – a very natural shot. The child can wear a t-shirt, no makeup, and hair should be as it might be on any average day. The second look should be more dramatic – a thoughtful or slightly sad expression, with hair styled differently and maybe a jacket or cardigan to add texture. Your child will also need more of a full-length picture to give a sense of the body – how they look in clothing and how they stand. Clothing choice should be fairly simple – the outfit should not take away attention from the child. The professional photographer shooting the child headshots should know how to approach it from a technical perspective, but what makes child headshots and modeling photos truly great is the child’s expressions. The smile should be genuine, of course, eyes should sparkle in a natural “I have a secret” kind of way. For the more dramatic look, you’re going for thoughtful, but not a forced expression. Sometimes it’s easier for parents to step away as too much coaching here can sometimes have the opposite of the desired effect. Drawing out the perfect expressions can be the most challenging part, but it’s also something I happen to be pretty good at – that’s why I am a child photographer! 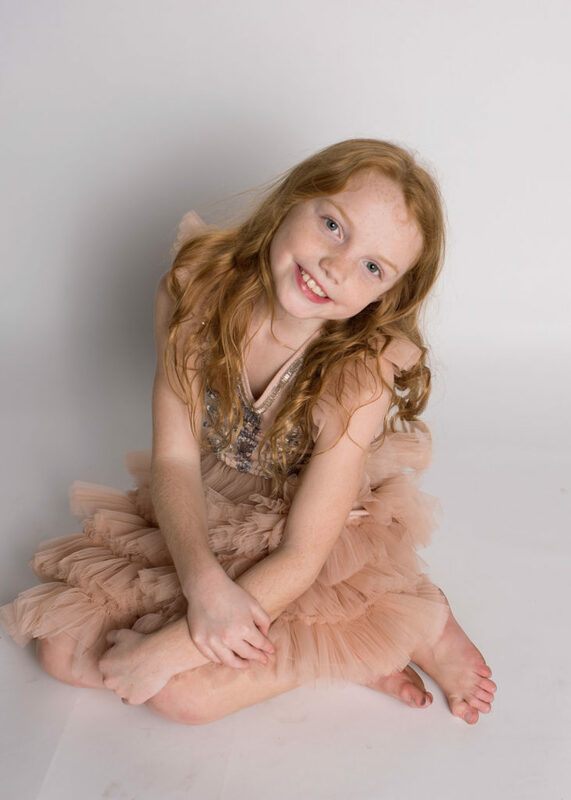 Great child headshots and modeling photos require both an excellent photographer (ahem!) and an eager child. If you have the latter, I’d love to do the job! Contact me at jennifer@freckledflower.com for more information. This project was a collaboration with Captured by Kristin Photography. This entry was posted in kiddos, photography tips, styled and tagged child model headshots, Child Photography, styled photography.